A dog’s diet is an important aspect to maintaining a long and healthy life. That’s why at Pet’s Delight, we’re delighted and proud to carry only the best dog food brands in the UAE. As fellow animal lovers, all of the brands we carry offer quality, all-natural dog food for your canine companion. Our full range of dog food in Dubai includes “free from” options, including grain-free, wheat-free and preservative free. We stock dry food, wet food and irresistible treats for canine companions of all breeds and life stages. Our friendly pet care experts have carefully selected our full range of dog food products to meet the nutritional needs of your canine companion. Whether your dog prefers kibble pellets, wet food or specifically formulated recipes, you’re sure to find exactly what you’re looking for in our selection of brands below. Acana is a regionally inspired dog and cat food brand that makes biologically appropriate pet food for your four-legged companion. Their range of dog food products is sustainably sourced and always delivered fresh without preservatives. This grain-free formula with 40% to 65% meat inclusions incorporates carbohydrate and glycemic limited ingredients that will nourish your dog in a way they’ll love. Applaws Dry is formulated with nutrient-rich ingredients to meet your dog’s needs. 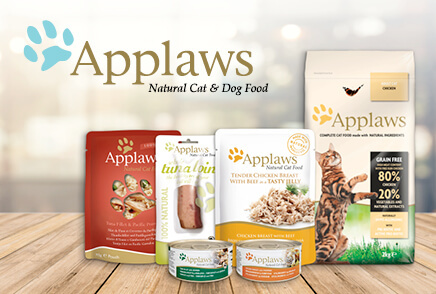 Applaws great range of dry kibble uses only the finest cuts of animal protein and nothing artificial. Their all-natural ingredients formula is also grain-free, providing a complete and balanced nutritious diet that helps keep your furry companion in peak health. Calibra believes that your dog’s health should always come first. Their diverse range of dog food products is developed in close collaboration with leading specialists in Veterinary Universities in Europe. From puppy to senior, their complete line of dog food and treats are made exclusively with premium animal proteins without grains, artificial colorants and chemical preservatives. Merrick was founded on the principle of wholesome, nutritious recipes free of fillers, additives and preservatives. Each of their recipes is handcrafted in the company’s own kitchen using only the freshest, highest-quality ingredients. Their complete range of dog food is 100% grain-free and is rich in protein, essential fatty acids, glucosamine and chondroitin, resulting in a healthy, happy and well-fed dog. Orijen is an award-winning pet food brand that is dedicated to the highest standard of nutritional integrity and authenticity. That’s why the complete range of Orijen dog food in Dubai is “biologically appropriate,” meaning each product is specifically formulated to meet the evolutionary needs of your canine companion. Each product is made from fresh, locally sourced ingredients free of grains, chemicals and preservatives. With 75% to 80% meat, it has one of the highest fresh meat inclusions among dry dog food brands. Pooch and Mutt dog food is grain-free and made from all-natural, PETA-approved, ethical ingredients to promote the “power of positive nutrition.” Each recipe in Pooch and Mutt’s range of dog food was created with the help of top canine nutritionists so you can be sure your pooch leads a happy and healthy life. Royal Canin’s range of products provides tailored nutrition to meet your dog’s unique needs across every stage of your dog’s life. Royal Canin’s precise nutritional solutions are founded on scientific research, nutritional knowledge and innovation. Each ingredient comes from exceptional-quality sources to provide nutritional solutions for dogs across various life stages, breeds and lifestyle requirements. Taste of the Wild believes in the pursuit of simplicity. That’s why each of their products are specifically created to provide your canine companion with a balanced diet free of artificial colors, flavours and preservatives. Their simplified approach to pet food sources unique proteins like wild boar and venison and is made from zero grains just like nature intended. Thrive takes only the very best ingredients to create a range of dog food that your pet will crave. No artificial additives, preservatives or flavourings are found in Thrive’s range of pet food. Instead, Thrive uses tasty, all-natural ingredients that contain all the essential nutrients and vitamins your canine needs. At Vitalin pet foods, the only choice is the natural choice. Their range of dog food combines a perfect balance of ingredients with the help of nutritional expertise and modern manufacturing techniques to support your pet’s overall health and wellbeing. Key ingredients include high-quality proteins, essential fatty acids, healthy carbohydrates and nutritional supplements. Each recipe is hypoallergenic, grain-free and preservative-free. 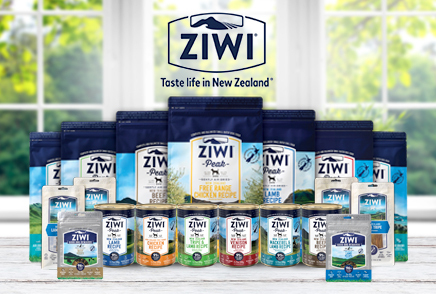 Hailing from New Zealand, Ziwi Peak sources all of their ingredients close to home, with a focus on a balanced, whole-prey diet. All of their recipes have over 96% fresh meat, organs, bone and seafood, making them have the highest meat inclusions among all pet food brands. They also use an air-drying approach to naturally preserve their pet food products. This technique eliminates the need for artificial preservatives, sugars or glycerines. 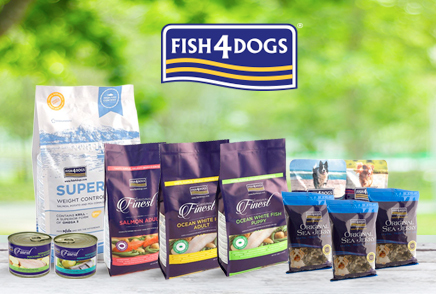 All of our dog food products are available for home delivery or click and collect across all of our stores in the UAE. Let our pet food online and in-store selections help make mealtimes in your home more delightful.